It is needles to say what an advanced and sophisticated device Apple’s iPhone is. Yet, many manufacturers around the world think hard about ways to make our iPhone experience even more convenient and pleasant and presenting more and more various iPhone accessories. And in many cases, the innovative solutions these manufacturers come up with turn out to be really impressive. For example, TidyTilt - a new multifunctional iPhone accessory. TidyTilt has two main functions. 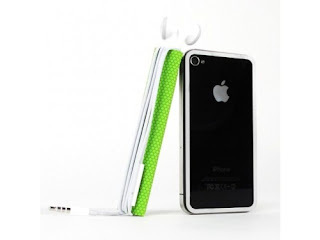 The first one is holding your earphones steady in your pocket, preventing them from getting tangled. The second main function of TidyTilt is keeping iPhone steady in a vertical position. You can change the shape and form of the TidyTilt, - so, you won’t have to get used to it - just keep on wrapping your earphones around your iPhone like you are used to doing.